HOLED UP-Traffic is snarled as workers dig up Kanan Road to get to a broken water line Tuesday. A 16-inch diameter water pipeline ruptured along Kanan Road Tuesday releasing an estimated 200,000 gallons of recycled water onto street, sidewalks and landscaping. The line break occurred at about 9:30 a.m. near the intersection of Kanan Road and Hawthorne Drive in the unincorporated community of Oak Park. Traffic was closed temporarily on westbound Kanan from Hollytree to Hawthorne. The pipeline is part of the Calleguas Municipal Water District’s Oak Park/North Ranch reclaimed sewer water system that provides irrigation for North Ranch Golf Course, local homeowner associations, roadway medians and other greenbelt areas. Kendall said crews are working around the clock until repairs are completed. Water supplies from the district’s drinking water delivery system, which operates separately from the recycled water system, will be routed to the affected areas until repairs are completed. 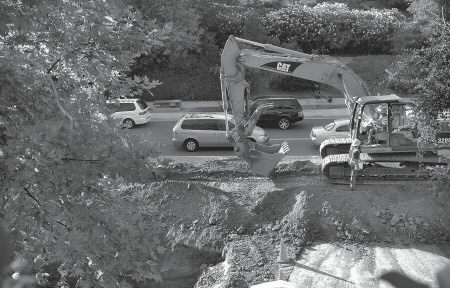 Calleguas is one of 26 member agencies of the Metropolitan Water District of Southern California and the primary water supplier for much of Ventura County, providing water service to a population of more than 550,000.
struction work is distrupting traffic for several weeks on Kanan Road just south of Oak Park in Agoura Hills.